Okay, so I didn't know what I wanted to be for Halloween and I had gotten invited to a Halloween party this last Saturday (10.29.2011) and that same day I went to go look for my outfit. I stopped by a couple Halloween stores and in one store I noticed that they were selling Pink wigs. Right off the bat I thought "Duhh! 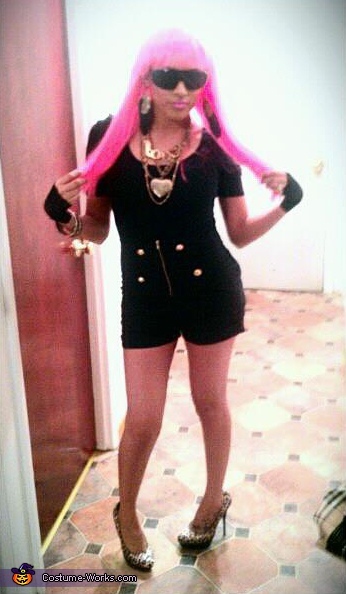 I can be my Idol, Nicki Minaj!" So I bought the wig and then I went to another store called Fashion City and thats where I found some Highwaist black Shorts that had some Gold button on them and I just knew that was something Nicki would wear. I already had a Black short sleeve shirt to go with it along with Gold Jewlery, and Leapord Cheetah print 5 inch Heels, (cause you know Nicki loves animal print) oh and I also purchased my lace gloves at Hot Topic. All together I just purchased the gloves and wig, and the rest came out of my closet! :) I Loved everything about my Costume and Everyone who seen it.. just LOVED IT!!!!!!!!! Oh Yeah.. My Boyfriend was Drizzy Drake and my Bother was little wayne!!!! It just made everything PERFECT!!!!!! OMFG i love you so much !! !